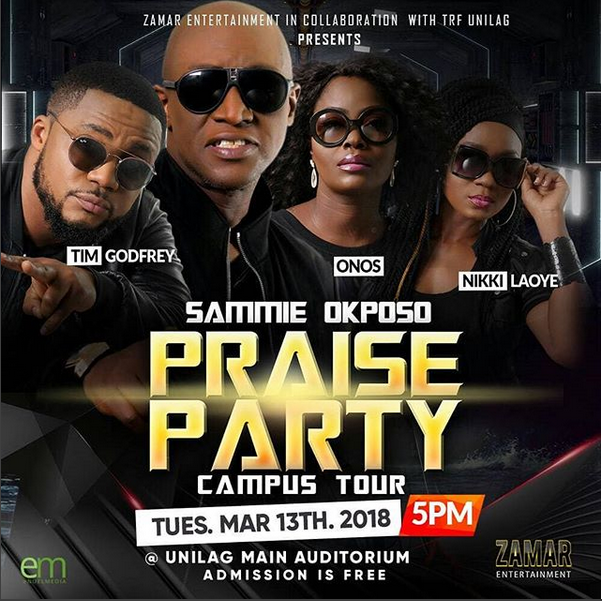 Popular Gospel artiste Sammie Okposo has announced his forthcoming campus tour themed “The Sammie Okposo Praise Party Campus Tour”. The tour is scheduled to take off Tuesday, 13th of March, 2018 by 5 pm. It is going to take place in the main auditorium, University Of Lagos (Unilag), Akoka, Lagos State. Other phenomenal gospel musicians will be ministering. Musicians such as Tim Godfrey, Nikki Laoye, and Onos Ariyo. Admission is free, so don’t miss it!